JRC’s new JMA-5200Mk2 continues the success of its predecessor, reaching a new level of performance, designed to seamlessly run radar images faster and more efficiently than even before. Other ship’s movement and speed can be monitored from length and direction of their trails, primary serving for collision avoidance. 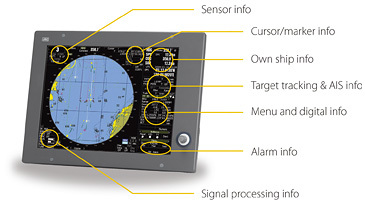 The JMA-5200Mk2 integrates four different trail length modes, that will show a ship’s course instantly, a unique operational feature that allows for more flexibility. Example real-time processing on the left. Developed exclusively by JRC, TEF™, allows target enhancement relative to the target size. The smaller echoes are far more enlarged than bigger echoes, giving a better on-screen separation and identification.TEF™ works by adding pixels to targets displayed on the radar image and allows a vastly improved degree of discrimination between targets. Sophisticated processing results in a proportional enhancement where the relative enhancement of smaller targets is greater than applied to larger targets. 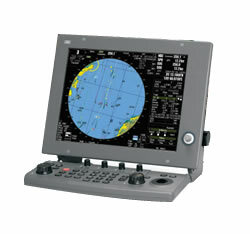 The JMA-5200Mk2 series make your radar images more brilliant than ever with a sharp 15-inch high resolution LCD screen. Menu selections, via the keyboard or trackball are clearly shown on the display – allowing “at a glance” interpretation of the radar image.You can also select day and night background modes and adjust the brilliance at your own convenience. If you switch between scanners (up to 8 possible – option), the information displayed is generated allows for consistency and uniform output. This new feature is easily accessible from the menu. 1. Display¹ Which cables? Std. Max.